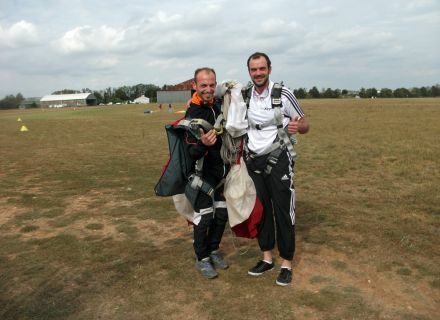 Home / Le blog / To do a parachute jump in Niort, it is Démenciel ! 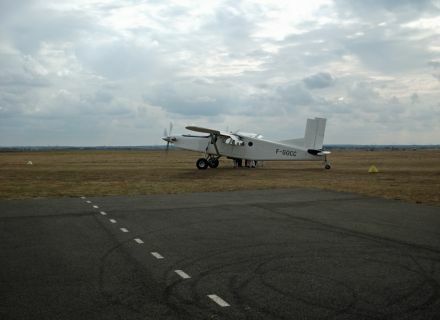 To do a parachute jump in Niort, it is Démenciel ! Démenciel Parachutisme. This is the name of this company niortaise of parachuting. We can imagine it is insane to throw itself into the space as height as 4000 meters ! 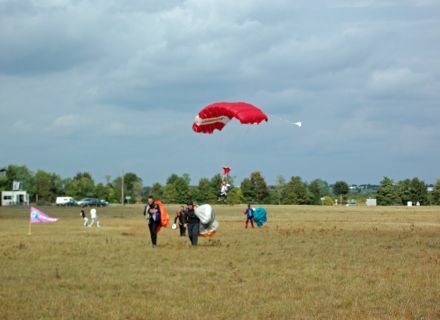 But here, to the aerodrome of Niort Marais poitevin, the team of Démenciel Parachutisme is constituted by qualified and experimented instructors, which make us share their passion in complete safety and in the good mood. Saturday, October 4th, 2 pm. I have a meeting at the aerodrome to make the big jump and celebrate a birthday. It is indeed today that the club niortais “Envol Niort Parachutisme” celebrates its 60 years. Created in 1954 by Maurice Sauvé, former military parachutist who participated in the Landing in Normandy at night from 5 till 6 June 1944, the club leans on the deprived partner Démenciel Parachutisme for the technical management of the sessions of jumps today. Together, they provide 5000 jumps a year, all the weekends from March till November. I go into the shed of Démenciel where there is already a lot of people. I am welcomed by Cris who makes me fill my sheet of information and gives me the first instructions. The use of the familiar 'tu' is rigorous. They know how to make comfortable at Démenciel Parachutisme ! I am then brought to join Alex, who will be my instructor and a partner during the jump. I do not know him but I already have a whole trust in him ! With Camille, who also realizes her first jump in tandem, we are briefed by Alex who explains us the various stages of the jump while equipping us with the harness. Not authorized to release the hands of the harness until we are allowed by a pat on the shoulder during the free-fall, legs were folded up upward... We record) all the positions in our head. Alex equips himself finally with the parachute tandem and proceeds to the last checks of the harness. Nedge calls us then to the microphone. It is time ! We go to the plane, Pilatus, piloted by Fred. We are 8 all in all to embark, we squeeze up, and it left for the take-off. During approximately 15 minutes, we rise in the sky niortais, we admire the view, perceives the city of Niort, the square of the Breach, the Donjon, the stadium René Gaillard (where Alex assures me that the inhabitants of Nancy will come to beat Chamois on November 1st ! 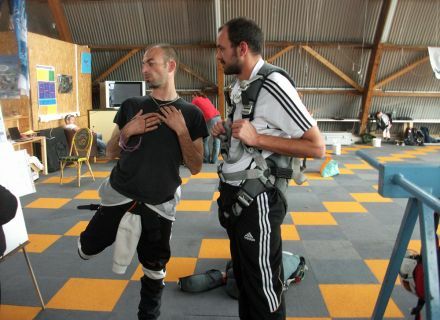 )… Alex restores me the various stages and the explanations for the jump and attaches my harness to his parachute. 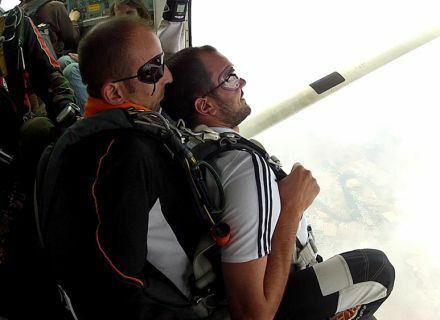 We clap hands with the other parachutists : 4000 meters, we are there ! 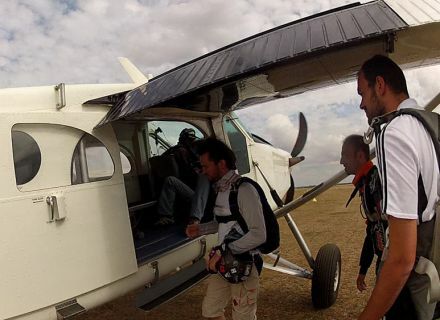 We open the door of the plane, Alex indicates me turning to the outside and putting my feet under the plane. I have feet in the space, hands hung on on my harness, glasses squeezed well around eyes… I leave the control with the instructor behind me. I am totally dependent on him. That's it, we fall ! The sensation is extreme, a real moment of ecstasy. I do not have the impression to go fast but we fall in the space about 124 mph ! 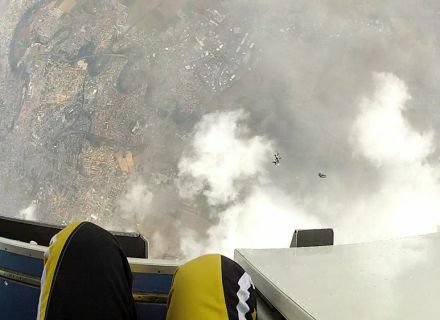 After 50 seconds of free-fall, Alex opens the parachute. We are a little shaken because we pass in a few seconds of a high speed in almost of on place. The descent then takes on an air of quite quiet walk. Alex chains the bends and tells me that he is more than 3000 jumps to his credit. I there, I take advantage of the last moments in the air, I look everywhere, the plain niortaise as far as the eye can see. After approximately 6 minutes of descent under sail, the landing zone is outlined. I raise legs and begin to walk. We're back again on the dry land ! We detache ourselves and Alex gets back his sail then we return to the shed. I thank him and begin to recover the descent in the head. Everything went so fast, I shall return to it well, there, at once ! 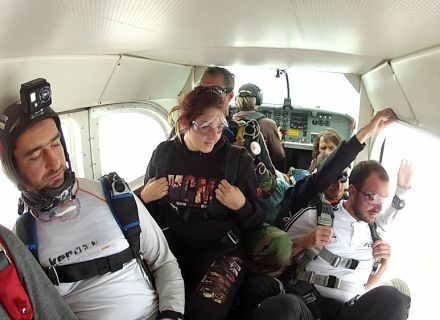 If you are more than 15 years old and that you want to discover the parachute jumping in tandem, do not hesitate to contact the merry band of Démenciel Parachutisme. They will indulge to welcome you and to make you share the sensations of the parachuting. 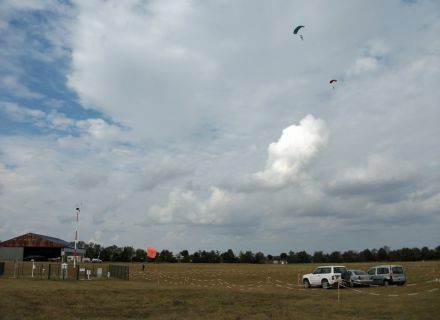 It is also possible to take advantage of the instructors experience to practise the jump in autonomy. Really insane !